This tour is a complete Indo China Tour and covers Laos Cambodia and Vietnam. 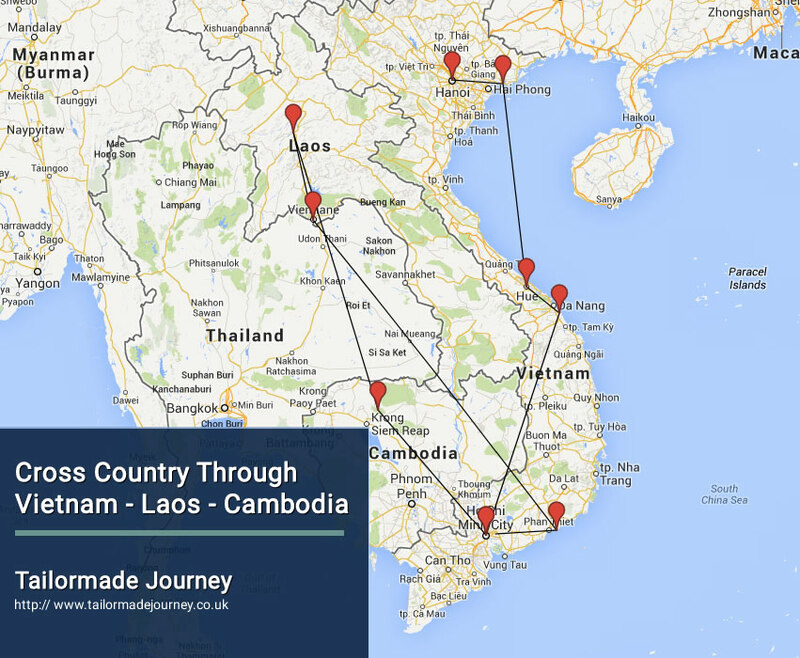 A cross country tour that covers all the main places of interest in The GOLDEN THREE. Upon arrival at Hanoi / Noi Bai International Airport, you are met and transferred to your pre booked hotel. Full day Hanoi city tour to visit Ho Chi Minh Mausoleum and his former residence (Closed on Monday, Friday and the whole of Oct & Nov), One pillar Pagoda, Temple of Literature. After lunch, continue city tour to one of the museums (Fine Art, History, Women, War, Ethnology Museum) of your choice (closed on Monday), Hoan Kiem Lake and Ngoc Son Temple and experience a one hour cyclo tour. Finish your day off at the Thang Long Opera Theatre for a traditional Vietnamese water puppet show. Overnight stay at the Hotel in Hanoi. Upon arrival, you will set out on a junk cruise on the bay while lunch is served. You will pass through the magical bay, where thousands of sculpted limestone islands rise from the waves like dragons’ teeth. After lunch, you will take a short trek to a nearby summit for a panoramic view of the bay, swimming on a quiet beach or sunbathing on the sundeck. In the late afternoon, you will visit an interesting fishing village with an opportunity to interact with fishermen who have been living in the bay for almost three generations. At sunset, you can kayak or simply take a bamboo row boat to discover a water tunnel with many coral reefs in a scenic lagoon. Back on board, you can enjoy watching the peaceful sunset and later unwind at a restaurant. You will stay overnight onboard. Rising to the sound of lapping bay waters, you will have time for an early morning dip followed by breakfast. Sitting on the upper deck, you can relax while taking in the breath-taking beauty of the rocky islands rising from the emerald water of the bay. After breakfast, explore Sung Sot cave (8 a.m. to 9 a.m.), swim and relax at Soi Sim beach. At 9:30 a.m., your boat cruises back to the jetty while brunch is served from 10:30 a.m. to 11:30 a.m. You will continue cruising through the bay, along the way seeing more of the fascinating formations. Cabin check-out is at 11:45 am. The boat arrives at the harbor around noon. After breakfast at hotel, visit the Hue Citadel – Vietnam’s former imperial capital and a recognized UNESCO World Heritage site. With an area of 500ha and a system of three circles of ramparts, this citadel is far more elaborate than those constructed by previous empires. Stop at Khai Dinh tomb, Tu Duc Tomb and Dong Ba market for shopping. Lunch at local restaurant. Morning, take a boat cruise along the Perfume River. Enjoy this romantic cruise and visit the Minh Mang Tomb. Finish up at Thien Mu Pagoda, one of the oldest ancient architectural structures for religious worship in Hue. Then, depart Hue for Hoi An via Hai Van Pass for whole view of Pacific Ocean and famous Long Co fishing village, on the way to Hoi An you will visit Cham Museum in Danang city where the remaining evidence of the Champa civilization can be viewed. Lunch at local restaurant then proceed to Hoi An. Check in hotel for relax. Morning, we transfer to visit My Son Holy Land – Vietnam’s most important Cham’s site. In 1999 it was named a UNESCO World Heritage site. My son becomes a religious center in the late 4th century and lasts till 13th century – a longest period of development of any monument in Southeast Asia. My son is considered to be Champa’s counterpart to the grand cities of Southeast Asia’s other Indian – influenced civilizations: Angkor (Cambodia), Ayuthaya (Thailand) or Borobudur (Java). Lunch at local restaurant. After lunch, walking tour of Hoi An, discover the historic town which used to be a prosperous seaport city during the 16th to 18th centuries. Visit Hoi An’s colourful local market, Tan Ky old house, Fukien Assembly Hall, and the 400-year-old Japanese covered bridge.Travelers can also see local residents raise silkworms and produce silk for Hoi An’s burgeoning textile industry. Today you are transferred to Danang airport for flight to Ho Chi Minh City. Arrive at Tan Son Nhat airport, transfer to the city center for check-in at your hotel. Breakfast at the hotel, drive to visit Cuchi tunnels (75 km northwest of Ho Chi Minh City) an important base during the American War, because of its strategic location. The Vietcong built a 200km long network of tunnels connecting command posts, hospitals, shelter and weapon factories. Dug out of hard laterite by hand tools without the use of cement, this amazing network was never discovered.. Lunch at local restaurant. Afternoon, visit Chinatown, Thien Hau Pagoda, the History Museum (in case this visit falls on Monday we will visit the War Remnants Museum instead) and make a quick photo stop at the former Presidential Palace. Overnight stay at the Hotel in Ho Chi Minh City. Today you are transferred to airport for flight to Siem Reap. Upon arrival at Siem Reap International airport the local tour guide will accompany you to Visit excursion to visit the floating village of Chong Khneas, located 10 kilometers south of Siem Reap. Take a traditional wooden boat for a ride on the Tonle Sap Lake, the “Great Lake” of Cambodia, one of the largest in Asia and flows into Tonle Sap River, joining the Mekong in Phnom Penh. We will see a fishermen’s “floating village” with floating schools, floating police station, etc. It is same as a big village floating on the lake, and the “village” move from place to place following water levels and current. Then check in at hotel. Afternoon, Visit Roluos Group. The monuments of Roluos, which served as the capital of Indravaraman I (reigned 877-89), are among the earliest large, permanent temples built by the Khmer classical art. Preah Ko temple, erected by Indavaraman I in the late 9th century and dedicated by the King to his ancestors in 880- Bakhong temple, the largest and the most interesting of the Roluos group temples, with his active Buddhist monastery just to the north of the east entrance Lolei temple, the four brick towers are replicas of the ones at Preah Kho, built on an islet in the center of large reservoir by Yasovarman I the founder of the first city of Angkor. Dinner will be at a local restaurant whilst watching a traditional Apsara Dance show. Overnight Stay at the Hotel in Siem Reap. Visit the South Gate (with its huge statues depicting the churning of the ocean of milk) the ancient capital of Angkor Thom (12th century) and then visit Bayon Temple (unique for its 54 towers decorated with over 200 smiling faces of Avolokitesvara), the Royal Enclosure, Phimeanakas, the Elephants Terrace and the Terrace of the Leper King and drive to a local restaurant for lunch. In the afternoon, visit the 7th world heritage, Angkor Wat a unique and stunning blend of spirituality and symmetry, an enduring example of man’s devotion to his Gods. It is the largest and undoubtedly the most breath taking of the monuments of Angkor and it is widely believed that it is the largest religious structure in the world. In the late afternoon, you will walk to the top of Phnom Bakheng to view the amazing sunset over Angkor Wat and other surrounding ruins. Morning, our tour guide will take you to the airport for your departure flight to Luang Prabang. Upon arrival in Luang Prapang airport, you will be met and transferred to your hotel. Overnight Stay at the Hotel in Luang Prabang. An optional early start gives you the fantastic opportunity to participate in the daily morning rituals of saffron-clad monks collecting offerings of Alms (often in the form of sticky rice) from the faithful residents. This tradition is very unique in Laos, being the only Buddhist nation still preserving the ritual. After breakfast, we visit the morning Phousi Market, where you will see such diverse offerings as dried buffalo skin, local tea and saltpeter among the chickens, vegetables and hill-tribe weavings. Today we’ll visit local villages of Lao ethnic minority groups at Ban Ouay, a Hmong village, Ban Ou a Laoloum village and Ban Thapene, a Khmu village. This then takes us to the beautiful Khuangsi Waterfall where you can cool off with a refreshing swim in the pools or walk along the forest trails. We return back to town by afternoon. Your half day city tour begins with a visit to the Royal Palace Museum, which hosts a range of interesting artifacts. We then head to the magnificent Wat Xiengthong with its roofs sweeping low to the ground, which represents classical Laotian architecture. Later we climb to the top of Phousi Hill for an enjoyable exploration of the sacred, gilded stupa and to enjoy a beautiful sunset view of the city and its glowing reflection on the Mekong River. From there, we explore the Night Market, where you can find a selection of handmade textiles made by the local and hilltribe people surrounding Luang Prabang. Overnight Stay at the Hotel in Luang Prapang. Today we embark on a cruise upstream on the Mekong River, firstly stopping at Xiengmene Village, where we visit Wat Long Khun temple and the limestone cave Tham Sakkarin, and a tour around Ban Xiengmene village. We then continue by boat up the Mekong which also gives us a breathtaking view of the tranquil countryside as well time to explore the mysterious Pak Ou Caves, two linked caves crammed with thousands of gold lacquered Buddha statues of various shapes and sizes left by pilgrims. After lunch, we return by road back to town. Along the way, we visit the village of Ban Xanghai, where they make the local rice wine and continue to typical Lao villages at Ban Xangkhong and Ban Xienglek, well known for its handmade Jute Sar paper. Today you are transferred to Luang Prapang airport to board flight for Vientiane. Upon arrival in Vientiane you will be checked into your hotel and following lunch your half day city tour enables us to see the major temples of Vientiane including the oldest, Wat Sisaket, a temple of thousands of miniature Buddha statues, and the former royal temple of Wat Prakeo, which previously housed the famous Emerald Buddha Image. We also visit Lao national icon, That Luang Stupa, and we stop to take some pictures of the imposing Patuxay Monument, which is Vientiane’s own Arc de Triumph. In the evening, a walking tour to the town center visiting the colonial buildings. We will end by the Mekong River on time for sunset. You may wish to sit down and relax at one of the bars along the riverside for a sunset. Today you are transferred to Vientiane Airport to board flight for Ho Chi Minh. Upon arrival Tan Son Nhat international airport, you will meet our tour guide to transfer you to Mui Ne Beach at Phan Thiet. They will return to pick you up to Tan Son Nhat Airport for your departure flight on the last day. Overnight Stay at the Hotel in Mui Ne. Today you are transferred to Ho Chi Minh City Airport to board flight for London Heathrow. Kindly fill the Booking / Request form with full name as per passport ( with Title – Mr / Mrs / Ms / Dr ) for all the Travellers / Passengers along with all the details as requested and Submit. We would require a deposit of 15 Percent or £ 300 Per Person which ever is more and balance 8 weeks before departure. The Deposit can be paid by bank / internet transfer into our bank account given below or in case you wish to pay by credit card a charge of 2.5 percent is applicable and you may call us on 01753 577330 and pay by credit card. Address : 175 Buckingham Avenue , Slough Trading Estate , Slough SL1 4RD. United Kingdom. Victoria Phan Thiet Resort features unique thatched-roof bungalows inspired by Vietnamese country houses. The resort has a spa and an infinity pool. Bungalows at Victoria Phan Thiet Beach Resort And Spa feature teak furniture and silk fabrics. Each has an outdoor courtyard with garden, pool or sea views. A hammock and outdoor shower in a private garden are also offered. Massages or facial treatments can be enjoyed to the sound of the sea at The Victoria Spa. The resort also has a fitness centre and sauna. Guests can enjoy a cooking class or explore the surrounding areas with free mountain bike rentals. Overlooking the sea is L'Oceane Restaurant & Bar, which serves international and local cuisine. Light refreshments accompanied by fresh sea breeze can be found at The Tea Bar. Allezboo Beach Resort & Spa is 2 minutes walk from the beach. Boasting a beachfront infinity pool, Allezboo Beach Resort & Spa offers air-conditioned rooms set in peaceful tropical landscapes. It houses a spa, fitness facilities and 3 dining options. Fitted with dark wood furnishings, spacious air-conditioned rooms open out to private balconies with ocean or garden views. They come with a flat-screen cable TV, safe and a minibar. Sun-filled afternoons can be spent at the tranquil beachfront or with a massage at Lotus Spa. Added conveniences include a business centre, tour desk and bike rental. Featuring a show kitchen, the poolside Allezboo Bar & Grill offers wood-fired pizzas and beach barbecues. Hearty local and Western meals with ocean views are available at Spicy Lobster. Allezboo Beach Resort & Spa is a 3-hour drive from Ho Chi Minh City. Pandanus Resort is 4 minutes walk from the beach. The Pandanus is a 4-star resort in Phan Thiet offering a private beach and a 10-hectare tropical garden. Free bicycle rentals and free shuttle bus to Ham Tien Beach are provided. Pandanus Resort has a variety of rooms that include telephone with access to international calls, satellite TV, and garden or pool views. The resort has a large free-form pool, with a hot tub for a dozen guests. Guests can enjoy the resort’s flood-lit tennis court. To relax, Pandanus’s spa centre offers a wide range of rejuvenating and restorative treatments. Sauna and steam rooms are located next to the spa. The Pandanus’s 24-hour Café Blue Lagoon Restaurant serves a variety of Western and Vietnamese cuisines. The pool-side Sun Terrace serves sandwiches, snacks and cocktails throughout the day. Located in the heart of Luang Prabang City, Villa Maly includes refurbished structures built in 1938. This beautiful property offers rooms built around an outdoor pool. Villa Maly is a 5-minute drive from Luang Prabang International Airport. Luang Prabang is a UNESCO World Heritage Site.The individually designed rooms feature a mix of French and British colonial décor. Each room has a flat-screen TV, a laptop-sized safe, and tea/coffee making facilities. The en suite bathroom has shower facilities. Guests can enjoy body treatments and massages at the spa. Travel services include concierge assistance and bicycle or car rental. The villa has a 24-hour reception and a business centre. This century-old former residence of Luang Prabang’s princess is just 500 m from the Royal Palace. Featuring colonial-style architecture, this boutique property boasts an outdoor pool, spa and fitness facilities. Villa Santi Hotel’s rooms and suites feature wooden furnishings. They are equipped with a TV and coffee/tea making facilities. Private bathrooms come with shower facilities and a bathtub. Sitting at the confluence of the Mekong and Nam Khane rivers, Villa Santi is a 5-minute walk from the night market. It offers a free roundtrip shuttle to downtown Luang Prabang, a UNESCO World Heritage Site. Offering all-day dining, Princess Restaurant provides an elegant setting for hearty meals. A bar offers light refreshments and drinks. Settha Palace Hotel offers stylish rooms with French colonial decor. The hotel is equipped with an outdoor pool, a business centre and meeting rooms. Free Wi-Fi is available throughout the hotel. The property is a 10-minute drive from Laos Wattai International Airport. It is a 25-minute drive from Thadeua. Rooms at Settha Palace boasts Italian marble floors and crafted rosewood furniture. Each room comes with a satellite TV, minibar and safety deposit box. A bathtub and free toiletries are included in an en suite bathroom. For guests’ convenience, the hotel provides luggage storage and laundry service. Free public parking is possible on site. Guests can sample French and Mediterranean cuisines at La Belle Epoque Restaurant or head to Sidewalk Cafe for international and Asian dishes. Light snacks and beverages are served at Poolside Bar. Green Park Boutique Hotel is located in the business district of Vientiane, near the city centre. Boasting classic Lao architecture, it features an outdoor pool, a spa, and rooms with private balconies. Round trip shuttle services to downtown area are provided everyday. Rooms at Green Park have cable TV, a safety deposit box, and a fridge with minibar. Tea/coffee making facilities are also provided. The attached bathrooms have a bathtub with hot and cold shower. Guests can exercise in the fitness centre, or relax on the sun loungers by the pool. The hotel provides tour arrangements and car or bicycle rental, as well as laundry and dry cleaning. Free Wi-Fi is available throughout the hotel. Featuring an open-air terrace, Sala Nong Chan Restaurant serves local and international dishes. Light snacks and drinks are available at Dok Da La Lounge. Aristo Hotel is located in Ho Chi Minh City, 2 km from Ben Thanh Market. Offering rooms with free WiFi, it features a spa, a gym and a restaurant. Aristo Hotel is a 20-minute drive from Tan Son Nhat International Airport. The Reunification Palace is only 200 m away, while Notre Dame Cathedral is 400 m away. All rooms are air conditioned and come with a flat-screen satellite TV, a minibar and a seating area. Private bathrooms come with a bathtub and a hairdryer. Services provided by the hotel include currency exchange, laundry and car rentals. Both local and international meals and beverages are served at DeliLah Restaurant for guests’ convenience. Sofitel Saigon Plaza offers luxurious accommodation, a fitness centre and swimming pool at the heart of Ho Chi Minh City. Near several shopping and entertainment options it is also close to major attractions, such as, Notre Dame Cathedral and Reunification Palace. Rooms at Sofitel Saigon Plaza offer views of the city. Decorated in a contemporary style, they are also fitted with a marble bathroom and free high-speed internet access. Room service is also provided 24-hours daily. Take a swim or work-out in the fitness centre to recharge. You can also relax with a massage offered at Sofitel Saigon Plaza. Enjoy a buffet spread of Asian and western fare at Mezz and sample French Provence cuisine at L'Oliver Restaurant. Sofitel Saigon Plaza also has 2 bars where you can enjoy a refreshing cocktail. This colonial-style 1920 landmark sits in the heart of Ho Chi Minh City, overlooking Saigon River. Hotel Majestic Saigon offers boutique-style accommodation featuring an art deco theme and a full spa. Surrounded by a variety of local shopping and dining options, Hotel Majestic Saigon is 500 m from the Opera House. Notre Dame Cathedral and Ben Thanh Market are a 15-minute walk away. Rooms feature details like stained glass panels and a colonial-style marble bathroom. Furnished with old-fashioned telephones and period furniture, rooms also come with a flat-screen cable TV. The hotel's charming courtyard pool is perfect for guests who want to lounge and sunbathe. Other facilities include a fitness centre and a casino. Guests can savour authentic Vietnamese cuisine at Cyclo Cafe or European cuisine at Serenade Restaurant. The outdoor Breeze Sky Bar serves a buffet breakfast in the mornings and char-grilled barbeque delights in the evenings. Edenstar Saigon Hotel is a convenient 5-minute walk to Co-op Supermarket and within a 5-minute drive to Ben Thanh Market. It features an outdoor swimming pool, while free Wi-Fi access is available throughout the hotel. Furnished with a wardrobe and seating area, modern air-conditioned rooms are equipped with a personal safe, a flat-screen cable TV and minibar. En suite bathrooms come with a hairdryer, shower facilities and free toiletries. Edenstar Saigon Hotel provides a fitness centre, sauna and meeting/banqueting facilities. Conveniences include a tour desk, business centre and free parking. Guests can also enjoy a pampering massage at the spa. The in-house restaurant serves delectable Vietnamese and international cuisines throughout the day, while the pool bar offers snacks and a wide range of beverages. Saem Siemreap Hotel is located in the garden village of Sala Kanseng, just 5 minutes' drive from the famous Old Market and Pub Street. Featuring elegant Khmer architecture, it also has an outdoor pool, spa treatments and a fitness centre. A free 2-way airport shuttle service is provided. Offering free Wi-Fi, all the air-conditioned guestrooms enjoy views of the gardens, pool or city. A flat-screen TV, free fruit basket and free tea/coffee making facilities are included. En suite bathrooms are equipped with a bathtub. Saem Siemreap Hotel is 7 km from Siem Reap International Airport. It is a 15-minute drive from the World Heritage Site of Angkor Wat Temple. The Silver Restaurant serves both Asian and Continental dishes, while The Ruby Lounge offers cocktails and spirits. Enjoy high tea at the Lobby Bar, as well as snacks at the Pool Terrace Bar. Tara Angkor Hotel features a spa, an outdoor pool, and 4 dining options. It offers Khmer cooking classes and free WiFi. Tara Angkor’s rooms feature wooden flooring and garden or city views. Each room has cable TV, a safety deposit box, and tea/coffee making facilities. The private bathroom provides bath amenities, bathrobes and slippers. Tara Angkor Hotel is a 15-minute drive from Siem Reap International Airport. The property offers complimentary airport transfer services. Guests can exercise in the fitness centre or relax in the sauna. Other facilities include a business centre and a gift shop. The hotel also offers tour arrangements and free use of bicycles. Buffet breakfast is served at Tong Tara Restaurant, which also offers all-day international dining. Frangipani Restaurant features a European and Asian menu. Cocktails can be enjoyed at Lily Lounge or the pool bar. Indochine Palace offers spacious and modern accommodation with free WiFi. An outdoor pool, night club and 5 dining options are some of the facilities available. Less than 2 km away are local attractions including Truongtien Bridge, Dong Ba Market, and Hue Museum of Royal Fine Arts. The hotel is a 20-minute drive from Phu Bai International Airport. Guestrooms at Indochine Palace open to a balcony with city, lake or pool views and feature a fireplace. A flat-screen TV and private bathroom with separate bathtub and shower are included. Work-out at the hotel’s fitness centre and relax at their spa afterwards. Sauna and steam room facilities are also available. Eldora Hotel is located in the town of Hue just 500 m away from Huong River. Free Wi-Fi access is available throughout the hotel. The building is 800 m from the well-known Notre Dame Cathedral. An Dinh Palace and Trang Tien Bridge are both 1 km away. Da Nang International Airport is 80 km from the hotel. Rooms feature stylish decor with elegant furnishings. Each room is fitted with a minibar, a tea/coffee maker and a flat-screen TV. A stand-alone sunken bathtub and a hairdryer are included in all the bathrooms. Guests staying at Eldora Hotel can have relaxing massages. Other services offered include bicycle rentals and currency exchange services. The 24-hour reception can arrange for airport transfers at a surcharge. The on-site restaurant will serve a delectable buffet spread of local Vietnamese cuisines and Western favourites. This 4-star hotel offers spacious accommodation, free Wi-Fi, and free parking in the heart of Hue city. Perfume River and shopping areas are nearby. It is 15 minutes drive away from Phu Bai International Airport. The Park View Hotel Hue provides comfortably furnished rooms that include cable TV and fully-contained bathrooms. Most rooms include private balconies with city and river views. Park View’s spa centre specializes in offering herbal therapy fused with modern techniques and features its signature massage called Foot Therapy. Dining options include the Park View Restaurant, which serves Western, Asian and Vietnamese cuisine. The Ben Thanh Café is ideally designed to allow relaxation while enjoying cocktails and views of Hue City and Perfume River. Palm Garden Resort is set amidst 5 hectares of beautiful landscaped gardens. It features a spa and 45 m outdoor pool. Resort-style rooms come with a balcony and free WiFi. alm Garden Beach Resort and Spa offers a free shuttle service to Hoi An Ancient Town, 5 minutes’ away. Da Nang International Airport is a 30-minute drive from the resort. Views of the garden or sea can be enjoyed from each room, which offers classic wooden furniture. Tea and coffee-making facilities, a safety deposit box and cable TV channels are a standard in all rooms. Guests can enjoy massages and body treatments at Palm Spa. Beach activities like volleyball and snorkelling are available at this resort. Featuring over 400 species of palm trees and plants, the resort’s garden is ideal for a stroll. Sea views await at Colibri Beach Front Restaurant, which serves an international menu and barbequed seafood. Vietnamese specialities are featured at Terrace Café, while Contino Club Bar provides the place to unwind over drinks. Hoi An Marina Resort & Spa is within a convenient 7-minute walk from Hoi An Ancient Town, a UNESCO World Heritage Site. It features a spa and wellness centre, while free Wi-Fi access is available in the entire resort. Fitted with parquet flooring, air-conditioned villas are equipped with a personal safe, a flat-screen cable TV and minibar. A wardrobe and seating area are also included. En suite bathrooms come with a hairdryer, bathtub, shower facilities and free toiletries. Accompanied with beautiful views of the river, the in-house Marine Restaurant serves Vietnamese and international cuisines in a buffet style. 24-hour room service is available. Mercure Hoi An Royal features an outdoor pool and a reflexology corner. Free shuttles bring guests to the town and the beach. Mercure Hoi An Royal offers rooms with hardwood floors and elegant wooden furniture. Each room has cable TV, a safety deposit box and tea/coffee making facilities. The private bathrooms are fitted with a bathtub and shower. Bicycles are available for guests to use for free. Car rental and tour arrangements are also provided by Mercure Hoi An Royal. Other facilities include a 24-hour front desk, a business centre. Buffet breakfast is served at the Royal Restaurant. It also offers Asian and European dishes for lunch and dinner. Drinks can be enjoyed at the bar, located beside the pool and garden. Bhaya Cruises feature Oriental-style luxury cruise ships in Halong Bay. It has air-conditioned cabin rooms and a restaurant. Bhaya offers a variety of onboard activities, such as Vietnamese cooking classes. Cabin rooms on Bhaya have a ceiling fan and a fridge. Private bathrooms come with shower facilities. A window provides natural light and views of the sea and islands as the ship sails around Halong Bay. Guests can join the Tai Chi morning sessions on the sundeck, or visit the spa for a relaxing massage. Water activities include swimming, snorkelling and kayaking. Vietnamese and international buffet meals are served at The Dining Room. Cocktails can be enjoyed at The Topside Bar while enjoying the sea breeze or watching the sunset. The Pelican Halong Cruise provides a fun-filled and relaxing stay on board of its ship. It also provides massage services. All rooms and suites have private bathrooms, a minibar and air conditioning. They are fitted with dark wood furnishings and offer great views of the sea. The suites are spacious and equipped with a bathtub. It also Offers a variety of activities like tai chi classes on the deck, fishing excursions and cooking classes. The all-day dining restaurant is serves Western and Vietnamese dishes for lunch and dinner. An international buffet breakfast is available daily. Guests can also enjoy refreshing drinks on the sundeck. Sofitel Legend Metropole offers pampering spa services, 24-hour room service and a heated swimming pool. It is located in central Hanoi, near the Old Quarter. The 5-star Sofitel Legend Metropole is just 160 m from the famous Hanoi Opera House. The scenic Hoan Kiem Lake is less than 500 m from the hotel. Still retaining the hotel’s original grandness, rooms feature either an elegant neo-classical theme or classic French decor. Fully air-conditioned, each room is equipped with free internet and a flat-screen TV. Offering a blend of Eastern and Western therapies, guests can indulge with a massage and body treatment at Le Spa du Metropole. So Fit Fitness Centre is well-equipped and provides exercise classes. The hotel also provides a business centre and gift shop. Housing a private dining room and outdoor terrace, Spices Garden serves Asian and Vietnamese specialities. Other dining options include Angelina Italian Restaurant and Lounge and Le Beaulieu French Restaurant. Drinks can be enjoyed at any of the hotel's 3 bars. Hanoi’s Silk Path Hotel is a 10-minute drive from Hang Gai and the French Quarter. The top-floor fitness centre has a steam bath offering panoramic views of Hoan Kiem Lake. Guests can rejuvenate with a work-out at the fitness centre or sauna. Silk Path Hotel has a hot tub, a quiet reading lounge and a 24-hour business centre. The air-conditioned guest rooms are equipped with a 32-inch flat-screen TV, a safety deposit box and a work desk. A minibar and tea/coffee making facilities are also provided. Local and international dishes are served at La Soie de Hanoi, while Bellissimo offers a Mediterranean menu of baked pizzas and pastries. Beer and cocktails are available at Silk Bar and Piano Bar. Silk Path Hotel is a 45-minute drive from Noi Bai International Airport. The Ann Hanoi is located in Hanoi. Free WiFi access is available. Hanoi Old Quarter is only 700 m away from the hotel. A seating area, flat-screen cable and air conditioning are featured in each room at The Ann Hanoi Hotel. Guests will also enjoy a minibar, electric kettle, desk and city view. It Offers an outdoor pool, a restaurant and a bar. Ann Hanoi Hotel offers a fitness centre, a 24-hour front desk, a concierge service and laundry services. Other facilities offered at the property include a shared lounge and a business centre.